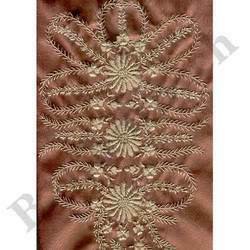 We are one of the leading suppliers and exporters of Embroidered Bullion Work. 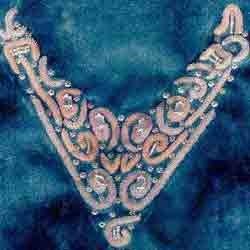 These are designed using imitation or pure gold and silver threads to create masterpiece. 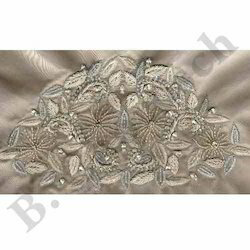 Our range is popular among various designers brand, high fashion sports & clubs and militaries for their Jackets, Blazers and also high fashion garments and Evening Wear. For our clients benefit, we also offer customized facilities. These embroidered sarees with detailed bullian work, thread work, cut dana and stone all in silver and pastel shade and matching unstitched blouse portray the exquisite craftsmanship of our designers. 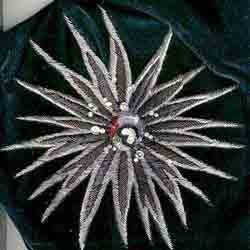 Looking for Embroidered Bullion Work ?